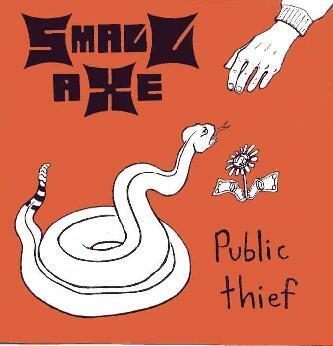 Small Axe - "Public Thief"
This is the new unreleased record from the US band (New York) called Small Axe. These guys play down and dirty nasty rock and roll. Here you get 13 tracks in 38 minutes. Vocalist DJ Miller has a really nasty dirty grungy vocal but somehow it goes with the music quite well. At times (his best singing) he reminds me of Rosetta West. The longest track on this CD is 3:51 and the shortest 1:10 (not really a track... strange ghostly noises and feedback). Most of the stuff on the CD is rocking, but "Strange to Eat" is a very emotional track and really different from the rest of the CD. They have some great song titles like "Muddle Your Brain", "Decapitate the Swarm", and "Love it Ugly". I wonder if these guys ever make it to Europe??? This is their fifth release so it is about time for this dirty rock and roll to make it our way! For more information you can visit the Small Axe web site at: http://www.smallaxerock.com.